About the author: Jennifer Posh is a writer, creative, and proud Slytherin based on Milwaukee, WI. You can find her blogging about vintage fashion and geeky lifestyle at TheSconnieSling.com. For many Harry Potter fans, a trip to Wizarding World of Harry Potter feels a lot like going home. Thanks to careful craftsmanship, talented staff, and even opportunities for real life magic sprinkled throughout the park, Wizarding World can be an ultra immersive experience…the only way to feel more like a real witch or wizard is to dress the part! The name “Potterbounding” comes from “Disneybound.” Due to the restrictions on adults wearing costumes in Disney parks, fans started dressing in outfits inspired by Disney characters that weren’t officially costumes – also known as Disneybounding. Though Universal Studios doesn’t have the same costume rules as Disney, the related name stuck! You don’t need any special costume pieces to create a Potterbound, though HP-inspired accessories can definitely help bring your look to life. One of the most popular choices is to dress as a Hogwarts student – all you need is a dark skirt or pair of pants paired with a white button-up shirt or a black or grey sweater. Add socks, jewelry, scarves, or other accessories in the appropriate colors to show your house pride! This is also the perfect time for a fun piece of easy DIY Harry Potter-inspired jewelry (like this Gillyweed necklace). If the student look isn’t for you, you can still create an outfit using your house colors for a fun, Potter-inspired look that will make you feel right at home on the streets of Hogsmeade. 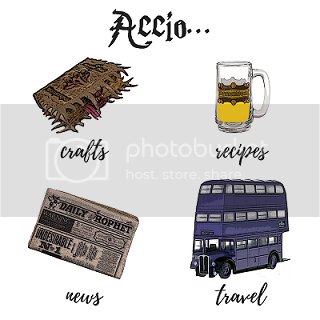 Pair a red and gold striped rugby shirt with jeans for a casual Quidditch fan look, or represent your favorite wizarding band with a DIY Weird Sisters t-shirt. No matter what your style, it only takes a little creativity (and a touch of magic!) to put together a fun Harry Potter-inspired outfit to wear at Wizarding World of Harry Potter. Next articleDIY Harry Potter: Luna Lovegood Wreath!